Wendy Palmer - Life! 4 with Mural Mosiacs! The 1988 XV Winter Olympics hosted by the Calgary community and it’s surrounding areas produced a phenomenal event. I was personally involved in the 1988 Winter Olympics, as I worked for OCO’88 in the Engineering Department, and what an exciting career opportunity this was. The City of Calgary incorporated over 8000 volunteers and 300 OCO’88 staff members who were involved in staging the Winter Games. Calgary welcomed over 2600 athletes from over 40 countries from around the world. Approximately 5000 members of the media who attended the Games broadcasted their stories to more than 1.5 billion viewers. Mount Royal University was involved with the Winter Olympics by housing a portion of the media in their facilities and provided recreation and food services to the majority of the media members. The people made the games come together, and every member of the community did their part, big or small, to help contribute to a very successful Winter Olympics to come together in Calgary. The original Olympic Games were developed in Ancient Greece. A sacred truce was announced for a period before and after the Games to assure safe travel for athletes and spectators and to stop warfare in the areas surrounding Olympia. The Olympic Games exemplified the Greek search for excellence, love of competition and belief in the development of physical health and skill. Revival of the Olympic values of harmonizing physical, mental and spiritual development was initiated by a French aristocrat and the first modern Olympic Games were held in Athens in 1896. So how do you represent this monumental event in one picture. Well, I decided to paint the XV Olympic Medal, as this precious piece of metal made from either Gold, Silver or Bronze is really what all the athletes train for years to try their best to compete for this symbol of excellence. Countries support and train their athletes to be world competitors in the largest games competition, so that they compete united as a nation against other nations to attain these symbols of excellence. The Olympics has brought people and countries together for hundreds of years and is the most popular sports event throughout the world, all competing for one thing, the symbol of excellence, the Olympic Medal. 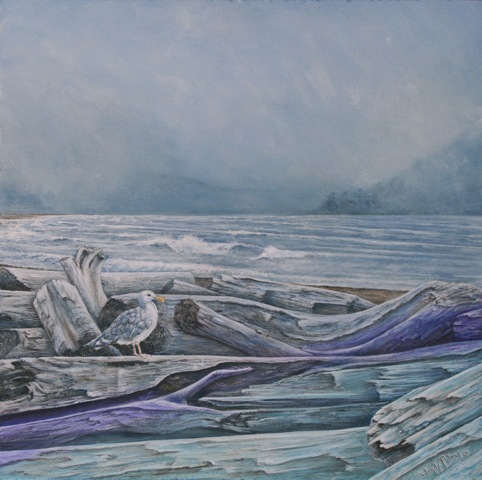 My family’s favorite summer get away is to head west to Tofino; located on the west coast of Vancouver Island. The Wickaninnish Inn is the only resort on beautiful Chesterman Beach, which is where we enjoy many relaxing days watching waves and walking the beach feeling the ocean breeze against our skin. The driftwood is found all along the beach, having been previously deposited by the ocean waves as a display of their tremendous strength. The ocean possesses so many unknown adventures, and the usually foggy mornings on Chesterman Beach create a mysterious atmosphere of what the ocean has in store for us. As the fog breaks, the sun will hopefully emerge for another beautiful summer day, and we can enjoy surfing in some of the best waves Canada has to offer, sea kayaking in the ocean to explore the abundant ocean ecosystem surrounding the island or hiking around the island grasping its beauty and splendor. Kunamokst ~ Coastal Inspirations Mural ~ Completed! When I first received my Mural Mosaic panel of blue and white tones, I instantly thought of a white horse, and my love of wild horses brought to mind a documentary I had seen about a pale palomino, wild horse stallion by the name of Cloud. Driving around Southern Alberta, I have occasionally seen some wild horse bands, and am always fascinated by their free and playful spirits. 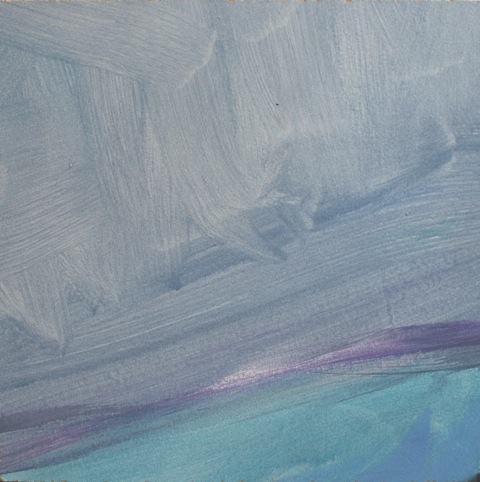 This painting of Cloud is dedicated to the preservation of wild horses for Cloud's herd in the Arrowhead Mountains and for wild horses all over North America. Le Cadeaux du Cheval ~ The Horse Gift Mural ~Completed! When Emmy Award-winning filmmaker Ginger Kathrens recorded a tottering newborn wild foal, she hardly anticipated how he would change her life. She named the pale colt Cloud. Cloud was born on May 29, 1995 in the Pryor Mountains of Montana, a range the Crow Indians call the Arrowheads. He is the son of the striking black stallion, Raven, and a golden palomino mare. Cloud was different from the other colts - daring and outgoing and keenly observant, his precocious personality kept his siblings on edge. At two years of age, Cloud left the band as a feisty adolescent to begin his bachelorhood. Cloud is a strong stallion who is unique, daring and resilient. He joined up with a group of other stallion bachelors, living free in the wild land. From lightning strikes in the summer to the brutally punishing assaults of a Northern Rockies winter, and attacks on the young by mountain lions, the wild can be a harsh environment for these creatures. Further complicating their existence, are the often controversial policies of the federal Bureau of Land Management, especially its helicopter-guided roundups aimed at keeping wild horse populations low. In 1997 one such roundup was recorded on film for this program by Ms. Kathrens, who, to her dismay, witnessed the capture of Cloud himself. But because of his unusual light color, Cloud was released. Cloud was the only captured bachelor to be given back his freedom that year. As Cloud matured into a young band stallion, family means everything to these wild horses as a means of survival and companionship. As the leader, Cloud fights to hold his family together, battles other stallions, and endures lightning storms, brutal winters, lethal predators, more government round-ups and a raging wildfire. Two sons dominate Cloud's story, one is not Cloud's by blood but will be raised by him. The other is Cloud's spitting image but will never know him as a father. This son is named Bolder. "Cloud is the most compelling and charismatic wild animal I've had the opportunity to film," says Ms. Kathrens. "But, covering his life on film has been a nerve wracking experience. I'm always relieved to get back up on the mountain and find he has survived another season." Ms. Kathrens hopes her film will help in that regard. "By getting to know Cloud and his family, perhaps we can all better appreciate and value our wild horses as a remarkable Native American wildlife species." A mural mosaic, unveiled during the Spruce Meadows Masters last week, had the power to strike awe and wonder in the hearts of viewers. Equine artists from all over the world joined hands to create panels for the masterpiece titled Le Cadeau du Cheval, or The Horse Gift. The project was designed by Lewis Lavoie, an Edmonton artist, to celebrate the horse. He coordinated mural artists and panels with fellow artists Phil Alain and Paul Lavoie. "The mural is a demonstration of unity through diversity," said Lavoie, who has been specializing in collaborative mural mosaics for the past four years. "The horse fits this theme best, as a co-partner with humans." 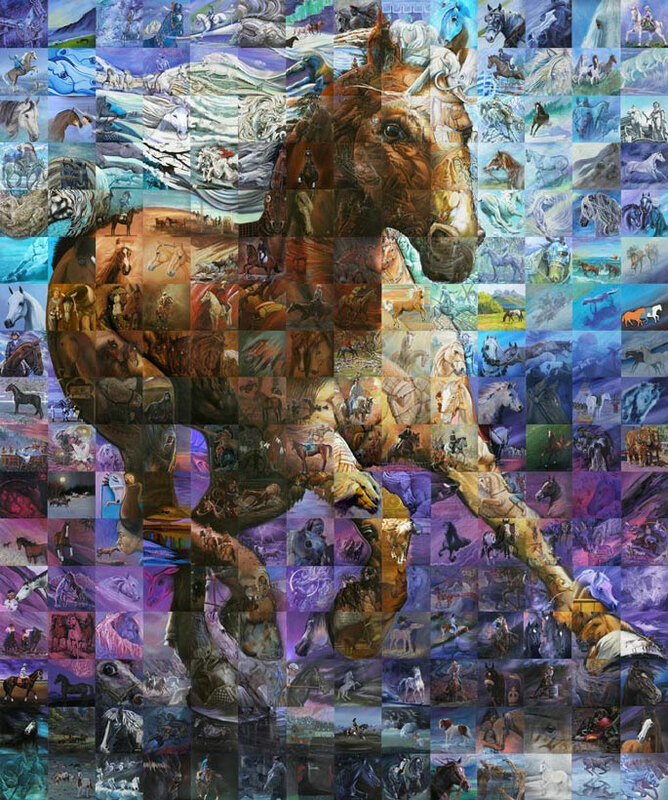 The stunning 24 by 18 foot mural used the combined talents of 187 of the finest equine artists to create 238 individual paintings that fit together to form one unifying image of a horse in motion. Lavoie said the internet played a big part in bringing horse lovers and equine artists from across the globe together. We mailed out panels to artists with only background colours pre-painted on them," he said. "Our cost for postage was about $10,000." Mediums used by artists included: oil, acrylic, mixed mediums, photo collage, foil art, water color and wood burning. "This works by letting the artist be totally themselves," said Lavoie. "What Ive discovered is that its kind of a biblical thing - there are many members, but just one body. The eye doesnt know what the foot is doing." One of the contributors was Rocky Views own Shannon Luyendyk, from Cochrane, who painted two mural pieces, numbers 165 and 193. "It was exciting for me to participate in this mural project because it depicts the subject matter I love - The beautiful horse," said Luyendyk. "What a perfect place for its unveiling at Spruce Meadows Masters where all the breeds are showcased as well as the many disciplines of horsemanship from around the world. 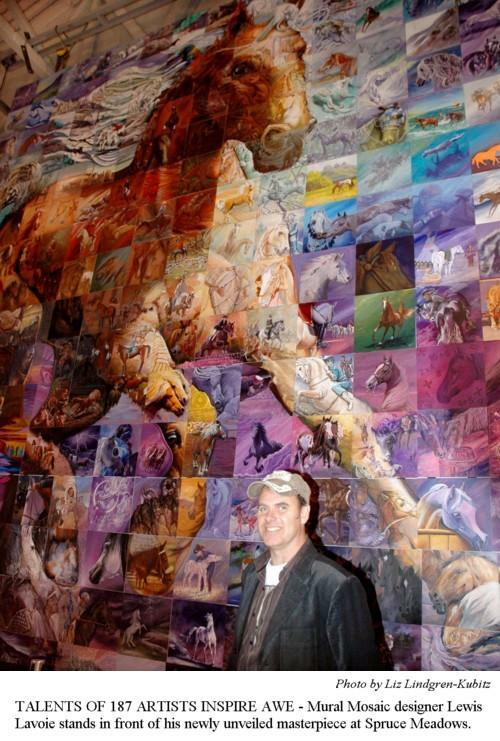 "This wall mural depicts all of this wonderfully by so many incredible equine artists from all over as well, added Luyendyk. "I am so privileged to have my work showcased with them." The Cochrane artist also had an opportunity to paint a panel for the mural mosaic which hangs in the Cochrane Ranch House. Her piece in that mural is entitled Trust. Earlier this year Luyendyk earned the 2009 Cochrane Heritage Award for one of her oil paintings titled The Fugitives. 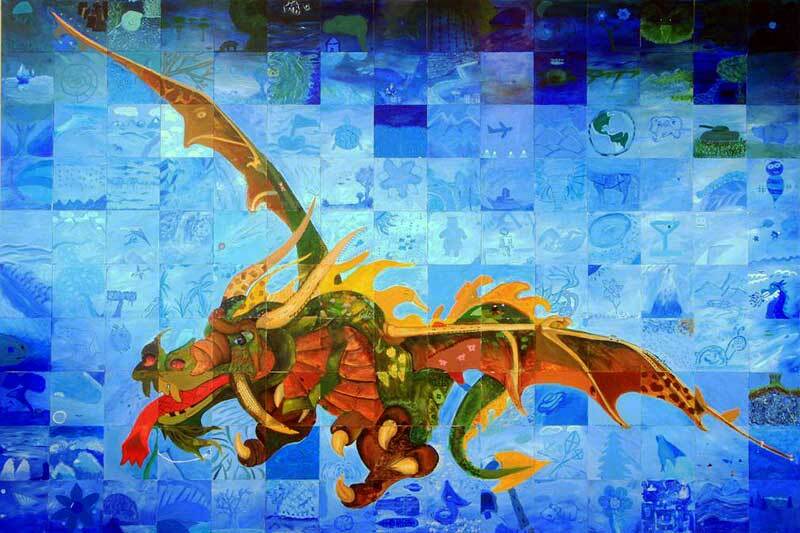 Each painting used in the Spruce Meadows mural reflects an individuals unique creativity and style and many of the panels have complex stories attached to the images. "If people choose to dig deep they will find that it goes much deeper," said Lavoie explaining a panel by a Peruvian artist that has become one of his favourites. Lavoie pointed out many panels, telling tales from each one. 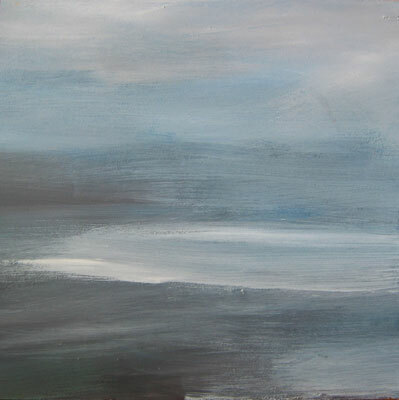 One such panel, number 182, was painted by German-born artist Delia Pacheco. Her horses, Ibn Astraney and Chut-Yanna, are subjects of her painting. Over the course of painting her panel, the second of these beloved horses died. Her own tears mixed with the paint as she completed the mural mosaic piece. "They died six months to the day apart, in 2007-2009," said the artist. "When I received the panel, there were dripping paint areas, and as I painted the images I noticed one of the drippings came through under Ibn's eye, making him look like he was crying, I kept it there," said Pacheco. "I cried every single day painting this panel, even incorporating my tears into the paint around their eyes, so I felt a part of me was in this painting. "This was the hardest painting I have ever done and it is very hard for me to let go, but just knowing I have immortalized them in this manner has made me happy and hope others will enjoy viewing it." Pachecos panel was only one of many paintings that held a spiritual quality. Some of the Canadian artists involved in the project attended the Spruce Meadows Masters and showcased their artwork in the Horizon Pavilion. All of them expressed a remarkable sense of privilege at being able to contribute to the mural mosaic. "Its kind of like a camaraderie with people Ive never known," said Diane Anderson of Cremona, who painted Roy Rogers and his horse Trigger on panel number 15. Michelle Grant, from the Calgary area, painted three panels. 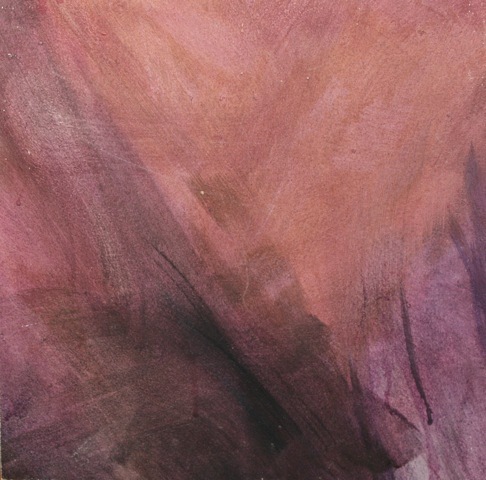 The painting she entitled Half Mile of Hell, shows a chuckwagon driver and his team in one corner and dramatic emotion in a horses eye in the other. The background colours of another panel she painted worked well to feature a portrait of Peach, her daughters pony who died of illness at an early age. "What I liked about the project was that it was a community effort," said Grant, who met regularly with six other artists at her studio to work on mural panels. Susanne Loutas, from St. Albert, also painted three panels for the mural. Her paintings portray horses from Greece, Poland and Peru, all countries where shes travelled. 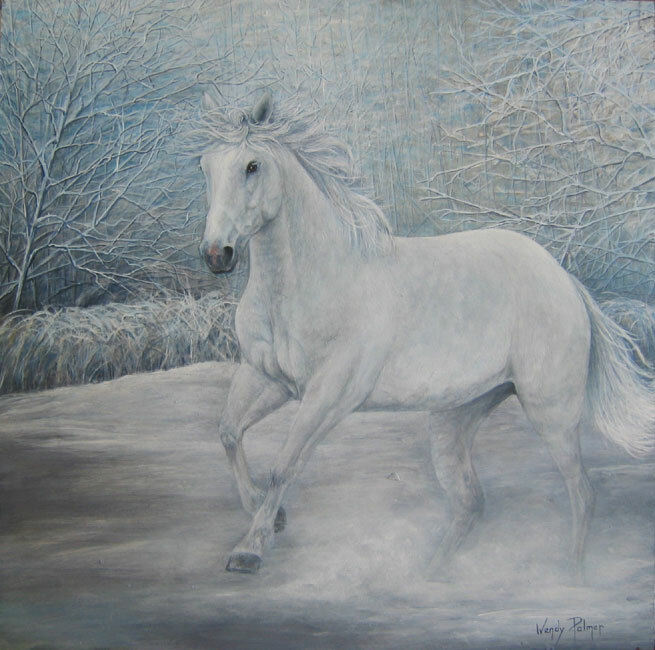 Wendy Palmer, an artist who lives just outside of Calgary, created a panel of Cloud, a real wild, white stallion. "This painting is a tribute to all the wild mustangs in the Rocky Mountains," said Palmer, who recently studied under wildlife artist, Robert Bateman. 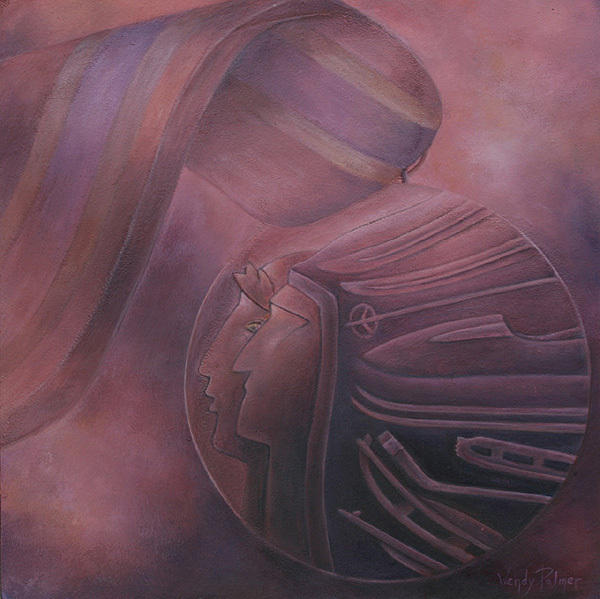 Western artist, Darcy Presoloski, was commissioned for two of the panels. She painted the face of a race horse on one and a barrel racer on another. When you get the panels you kind of have to go with what you get," said Presiloski with respect to colours and shapes in the background. "I must have stared at one of the panels for two weeks trying to decide what to paint." From Spruce Meadows, the mural mosaic will be traveling throughout Canada, the United States and other destinations. An interactive mural mosaic can be accessed at www.muralmosaic.com/Cadeau.html that provides information on each panel and the artists who created them. 32 Red Deer Lake Grade 8 & 9 Students collaborate on an intricate mosaic mural that is a composite of 150 individual paintings. 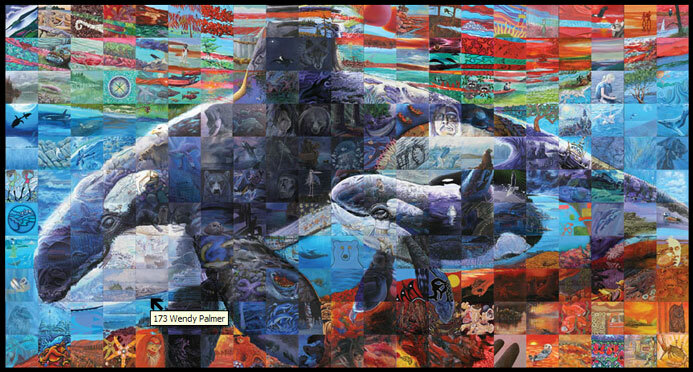 The mural is 3 metres x 4 metres and will be displayed at the Red Deer Lake School. Here's a link to the newspaper article in the Western Wheel. Red Deer Lake Grade 8 & 9 Students mural. 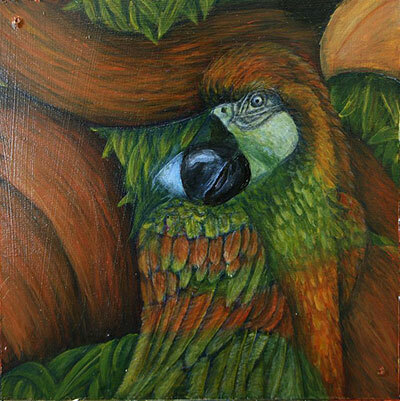 Wendy painted the eye of the Dragon mural which is this parrot. I Love kids' freedom in their art. Working with junior high kids, they're still at the pointthat they haven't been regimented in life, they have a Free Spirit and i love working with that!